Hello everyone, and Happy Spring! 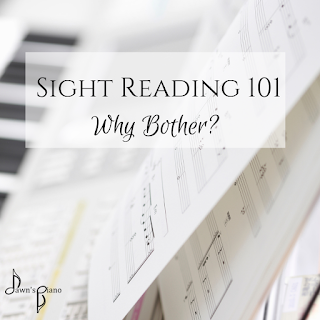 I'm going to be kicking off the Spring season with a blog series all about sight-reading. I've definitely touched on this in the past, especially with some app recommendations over the years, but I've not dedicated any blog space to why we bother learning it, or to really dig into how we can help young pianists train their brains to be successful at it. So this April, we're diving deep into sight reading! Why do we bother learning sight reading? Music literacy - Playing music vs. reading it is often compared to speaking vs. reading language because all of the reasons we value language literacy translate to musical literacy as well. It's universal - you can hand any classically trained musician anywhere in the world a piece of sheet music, and they'll be able to turn it into music. Much like language can cross borders & build bridges, so can music, and music literacy makes the communication between musicians soo much easier. Recognizing larger patterns - when we're trained to read literature, we're taught some basic literary technics often employed by authors. The same happens in music, as music students learn & grow, they will also begin to recognize common technics & styles used by composers. Recognizing these larger patterns in an artistic work give us footholds both to understanding and expressing the music with more fluency, or musicality, and helps us shape our own original improvisations or compositions in our chosen style. We get to go on new journeys. When you sit down to read a book you’ve never read before, it’s exciting and you don’t quite know where it will take you. Often reading a new piece will bring a similar delight of discovery, there will be surprises, passages that make you smile or draw out an emotional response. Sight reading helps musicians open these doors for themselves, the same way an independent reader isn’t forced to wait for a parent or teacher to read them stories anymore. The ability to play a piece of music you've never heard before. Even the best by-ear musicians have not heard every song in the world, so being able to look at notes on a page that's been handed to you and turn them into sounds, and then those sounds into music is a valuable skill for all regularly performing musicians. Composing your own music. In the summertime in our studio, we run our Young Composers project in which students compose an original piece of music, notate it and record it for the studio album. Being able to write out the music is a way of formalizing original compositions, to have a tangible copy of the thing that you've created, and to share them with other people beyond just an audio recording. This is incredibly validating for both new & seasoned musicians. Cultivating well-rounded musicians - right on the home page of this website, my stated mission is to grow "whole, well-rounded musicians," and since the ability to read a piece of sheet music is one of the internationally recognized standards for a 'well-rounded musician,' it definitely seems worthwhile to build this skill. Now all this isn’t to say that you can’t be a very talented musician if you aren’t able to sight read. Music obviously has so many avenues for entry and tools available for us to use. Sight reading is just one of these, and kind of a big one, so I would be remiss in my teaching if I didn’t at least expose students to it. The same is true of playing by ear, its an incredibly valuable & versatile tool, so we do ear training too. Fluency in our musical language can only make us more competent in our musical endeavors. Stay tuned in throughout this month for some of the tips & tricks students can use to train their brains for sight reading, and help them become confident in their abilities. Coming next week is a discussion of landmark notes!